NISIM's exclusive Amino Acid Complex works in perfect harmony with carefully chosen, gentle cleansing compounds to help maintain natural, healthy looking skin making it the best body wash for dry skin. Directions: While in the tub or shower, apply NISIM Body Wash to a soft sponge. Gently massage the rich foam over all parts of your body - for at least 30 seconds. Rinse off completely with lukewarm water. Pat your body dry with a soft towel. Use daily for best results. Caution: Do not use on areas of the body that have open sores. For even better results, follow up with NISIM Clinical Strength Body Lotion. For best results use with Nisim Clinical Strength Body Lotion and Dermylex Supplements. What is the best lotion for dry skin thatÃ¢â‚¬â„¢s compatible with the Body Wash? Is this the best body wash that will moisturize dry skin or alleviate skin dryness? 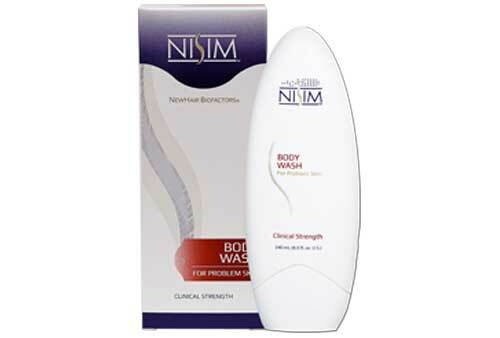 Although this is the best body wash for dry skin, Nisim Clinical Strength body wash will not directly moisturize dry skin. It will help clear up and tone areas with skin problems that are a result of excessive dryness and itchy skin and will not cause irritation. Please use our Body Lotion. If used with Nisim Clinical Strength Body Lotion on dry skin you can deeply hydrate dry skin patches. Will this help clear dry skin rashes and dry skin irritation? Yes the body wash is formulated to help clear up skin problems that are a result of excessive dryness, rough or scaly skin. For serious skin issues or problems consult a doctor. Is this an all natural ingredient product? Yes. This is an all natural skin care solution to help keep natural, healthy looking skin without the harshness of chemicals from typical antibacterial body wash..
Am able to use this body wash on my face? The body wash is safe to use on the face but is not specially a facial cleanser. Ensure not to get any of the body wash in your eyes. If the body wash gets in your eyes, flush your eyes with water. Is this the best body wash for sensitive skin? Yes. This body wash will not irritate sensitive skin. What other skin care products does Nisim carry? Although we have not conducted any studies to confirm this we have never had a report of any adverse effects resulting from using Nisim with other products. Having said that, combining products can result in adverse effects it can also alter the effectiveness of one or both of the products. If you notice any discomfort while using Nisim with any other product discontinue the use of one or both of them immediately. Does NisimÃ‚Â® shampoo help with any minor scalp disorders? Yes, NisimÃ‚Â® shampoos have proven very effective in controlling and reducing minor scalp disorders such as itching, dandruff, etc. Are NisimÃ‚Â® products effective for anyone undergoing chemotherapy treatment? We carry Nisim Clinical Strength Body Lotion and Dermylex skin care products. Does this body wash help with dry scalp?